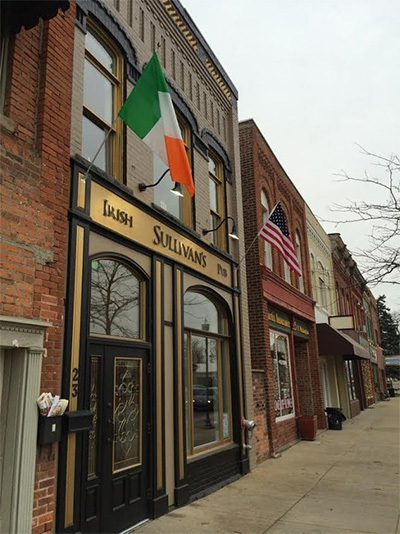 Sullivan’s Public House is a family owned and operated Irish restaurant and bar located in Oxford Michigan. With thirty years combined hospitality experience between Ireland, New York and Michigan Jamie & Jerry Cremin bring Sullivan’s Public House to Oxford. Jerry was raised in the “pub” business when his parents moved back to Ireland in 1990 from New York and opened “Jeremiah and Joan Cremin’s” in Abbeyfeale Co. Limerick in 1993. At a young age counseled by his parents on how to pour that “perfect pint” of Guinness he grew attached to those guests that frequented his parent’s pub, and looked forward to those weekends off from school that he could help out and make a “few pounds” in doing so. Jerry gained the necessary experience and love for the business and moved on to non competing owned businesses to further grow. Jerry moved back to New York in the earlier millennia and got right back to the pub business. Jerry’s route in the business started by first bartending at Snapper Creek on the Upper East Side of Manhattan, moving on to Flanagan’s Pub and Restaurant and then moved out to Dan Foley’s and Durow’s of Glendale Queens. A woman he greatly admires by the name of Bridey Keane took him on as a bartender and then promoted to a Manager. Jerry then took this knowledge and quickly moved through the managerial ranks of Manhattan from Libation to Tavern on the Green and finally The Plaza Hotel. Having met the love of his life Jamie Dunaskiss in New York, they married in 2010 and decided to move to Lake Orion Michigan in 2011 to start a family and life together. Jamie Dunaskiss no novice to the social aspect of life grew up a daughter to an Elementary School principle and state senator. Similar to the Jerry, working in the food and beverage industry came early for Jamie holding positions in Lake Orion neighborhood favorites such as Eva’s Ice Cream Parlor and Zim’s Irish Pub. Jamie graduated from Michigan State with a degree in Marketing. Moved to New York in 2003 for adventure. Jamie with her passion for hospitality went on to play very crucial roles in the success of many Manhattan’s favorite restaurants such as Orchid, Libation and 212. Libation was to be the catalyst for what is being established today in Oxford; that is where Jamie and Jerry met. Nine years later Jamie and Jerry Cremin offer you Sullivan’s Public House; Céad Mile Fáilte!